But is the MVP a path to success? Our October 2016 study of 2,400 consumers provides some new data that suggests you may want to reconsider how “minimum” your MVP is. In October 2016, we split a representative sample of the American population into two groups of 1,200 — we asked the first group about a company they were satisfied with, and the second group about a company they were unsatisfied with. Q. How reliable are [company name]'s products/services? What really stands out to me about this data is how it is distributed. If a reliable product or service had the same effect on satisfaction as an unreliable product, we would expect the satisfied and unsatisfied customers to mirror each other in the chart. But we don’t see that. 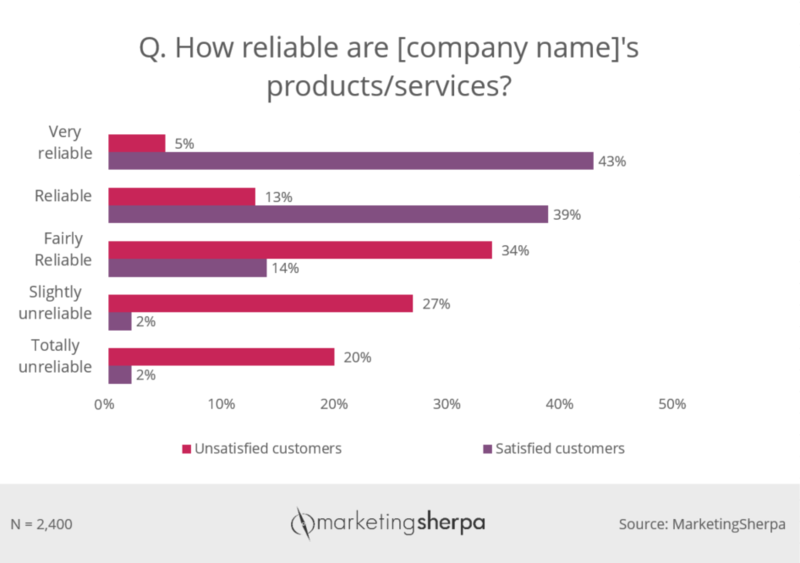 The most frequent response from satisfied customers (43%) was that the company’s products or services were “very reliable.” However, the most frequent response for unsatisfied customers was “fairly reliable” (34%). The responses for satisfied customers skew heavily towards reliability while the responses from unsatisfied customers were much more evenly distributed. In other words, it takes much more to win over a customer than to lose her. You need a very reliable product to satisfy a plurality of customers, but will lose a plurality of customers with even a fairly reliable product. Three out of five just isn’t good enough. Which brings up the question — is the minimum viable product enough to win over customers? MVP is more focused on features than reliability. And as I was reminded while reading a Consumer Reports article about automobile reliability over the holidays, simpler products can be more reliable partly because they have less features that can break. However, what are we really discussing when we talk about reliability? It’s not just an independent quality metric; it’s an essential element of the customer experience. And releasing a product that’s not ready for primetime quality-wise hurts the customer experience, independent of the number of features. When I shared the data with Sean Ammirati, Partner, Birchmere Ventures, and Adjunct Professor of Entrepreneurship, Carnegie Mellon University, he talked about the importance of that customer experience. “It's easy to assume you can just release your product and get the feedback you need to improve it. After all, the essence of the Lean Startup Movement is releasing ‘Minimum Viable Products’ and learning from your customers. However, it's important to clarify that viable doesn't mean crappy,” Sean said. To the marketer, this means you have to decide when the product is ready to launch to customers. And more granularly, how many customers should you start with, which customers should you start with (for example, you can start with influencers or champions to encourage word of mouth, but could get burned with negative reviews and alienated customers if the product isn’t “awesome” enough), when should you expand to invest in reaching more potential customers, etc. 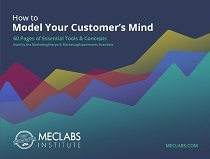 One way to think about it is to use the Optimization Sequence from the parent research organization of MarketingSherpa, MECLABS Institute — you should begin by optimizing your Product Factors, then optimizing Presentation Factors and finally Channel Factors. Beacause you really only have one chance to make a good impression, if you don’t create an amazing experience for customers with new products, how likely are they to give you a second chance? So before working on a landing page or other marketing for a product or service, make sure it creates an awesome customer experience. And before you start investing in channels (like print ads or search marketing) to drive traffic to that landing page or other purchase experience, make sure you have an amazing pre- and post-purchase experience. If you don’t, you are likely wasting a significant amount of money sending precious customers into a subpar experience to buy a subpar product and ultimately burning their goodwill.